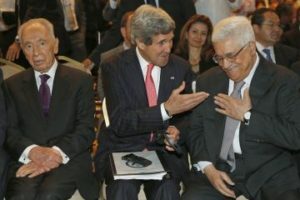 WASHINGTON — Israelis and Palestinians are at it again, and it looks like peace talks will fail to coalesce yet again. This is new Secretary of State John Kerry’s last-ditch attempt to get the two sides to reconcile and come to the negotiating table, but Reuters reports it could be scrapped sooner than later. Kerry, of his failed 2004 presidential bid fame, is trying to get Israeli and Palestinian representatives to renew talks that fell apart in 2010 over Israel’s settlements. Palestinians continue to insist on a state of their own. The Palestinian Authority, which is one of the two governing bodies for Palestinians (in addition to terrorist group Hamas in the Gaza Strip), says it is pushing for a Palestinian state that will go back to the 1967 borders. Israel is refusing to bite on this latest proposal.